Download the completed Ableton Live set and VDMX project for this tutorial and the Livegrabber plugins. When using VDMX to create visuals or VJ alongside other software tools it is possible to send control information back and forth by using open standards such as MIDI and OSC. This is particularly useful when using other software to make music, or when collaborating on live performances with musicians for keeping parts of the audio and video tracks in sync. One of the most popular tools for creating music today is Ableton Live, which in addition to natively supporting MIDI in and out for syncing with hardware controllers and other software, recently added a powerful new way for users to customize their projects with custom plugins written with Max/MSP. Over the last few years artist / programmer Mattijs Kneppers has been developing “Livegrabber,” a set of plugins that can be used to easily sync Ableton Live with other applications by echoing out actions in Live over the OSC protocol. For the release of the newest version of the plugins, we're joined by Mattijs and Auke from Studio Rewind to show off four different ways to use the Livegrabber plugins with VDMX. 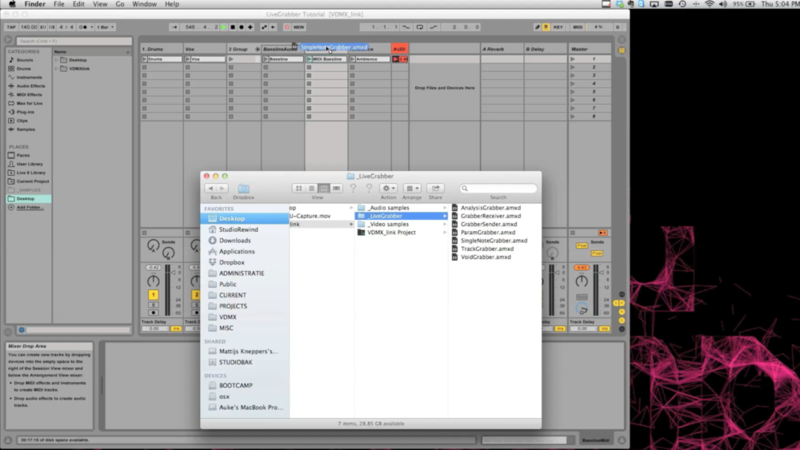 Also check out more tutorials on using Ableton Live with VDMX or the basics of MIDI / OSC setup. 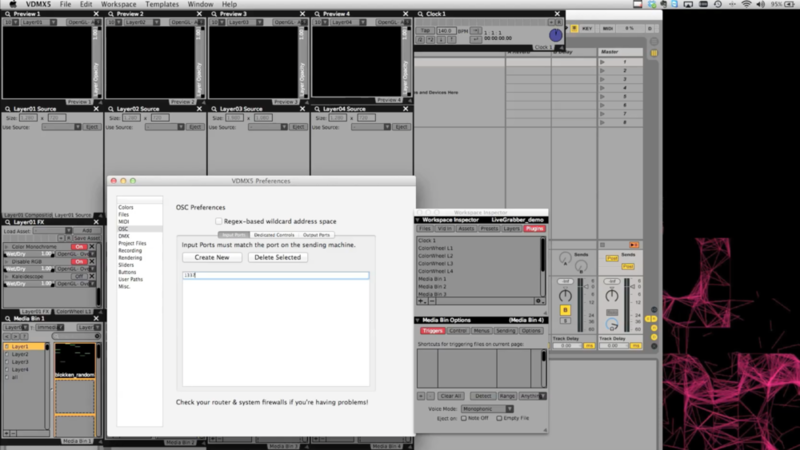 In the VDMX Preferences under 'OSC' set up the Input Port to receive messages from Livegrabber. Use the 'Convert Drums to New MIDI Track' option in Live 9 to create control data from an audio track. Applying the 'Single Note Grabber' plugin to a MIDI track in Live by dragging from the Finder.